The following day, we go to the Pilgrims Mass, not really knowing what to expect. We got there a half hour early but still ended up standing, but we are able to get up close to the alter. The Mass begins, in Spanish of course, and there is little we understand, but we know the the general meaning. The Mass was brought alive by a nun leading many of the prayers and singing the Kyrie Eleison and Agnus Dei. After taking Communion, the atmosphere changes with an air of anticipation of what is about to follow. A group of monks crowd together around a rope situated not far from the altar and start to pull with all their might. The organ music changes to what I can only describe as dramatic, Phantom of the Opera style. 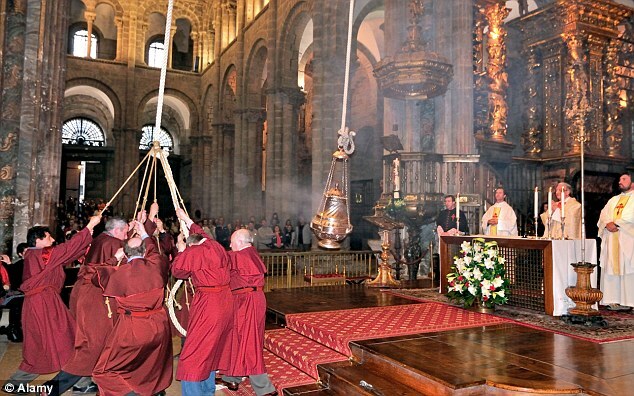 Then the enormous incense burner is hoisted into the air, and it begins to sway back and forth. With momentum gathering, it gradually builds up speed and goes up as high as the ceiling and from one end of the Cathedral to the other. It is truly spell-binding. It carries on for some minutes and then gradually comes down and a Priest expertly manoeuvres it back to its starting position. For me, it was a symbol of strength in my religion and faith. I felt energised by the whole process and went away feeling it’s time I was more pro-active about my faith.